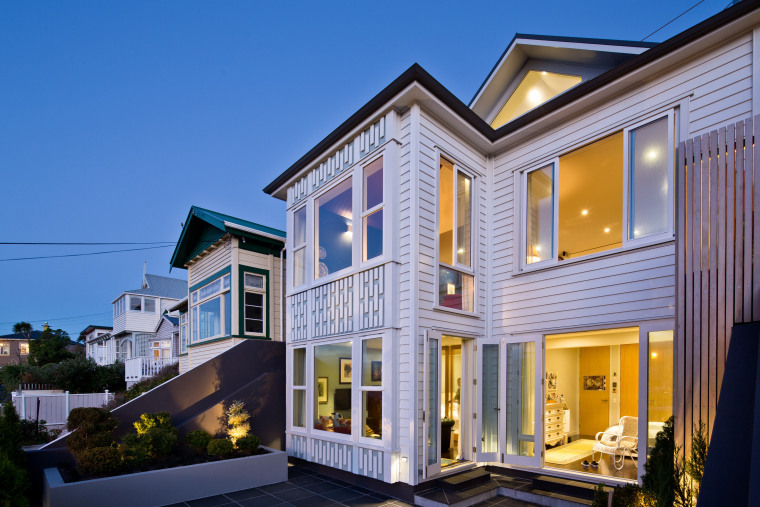 This renovation by architect John Mills retains the classic looks of the original exterior. The only visible exterior reference to a transformed interior are a new roof peak and a modern fretwork design. 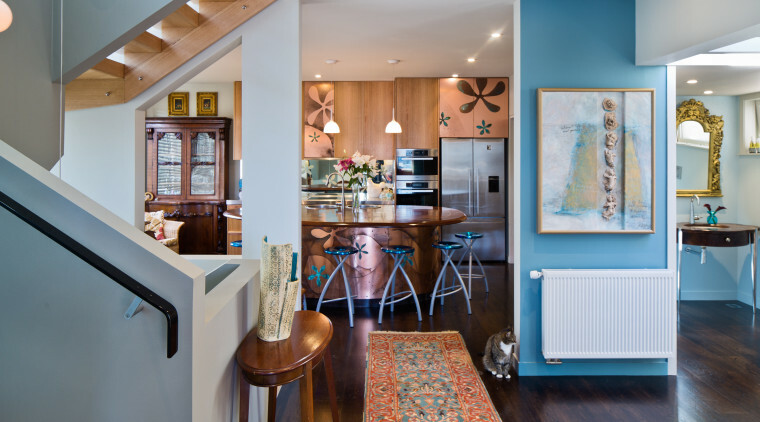 It's always a balancing act for a renovation, creating an open, modern home that at the same time evokes the character of the original design. The brief for this project was to reinvent a one-level-plus residence on a sloping site into a spacious three-level home with nods to the past. Architect John Mills says the owners wanted a floor for their daughters and a master bedroom suite for themselves that connected to the sloping backyard rising steeply behind. "The original period interior was a typically claustrophobic arrangement of a corridor and small rooms. This was virtually gutted, with the basement dug out to incorporate a new lower bedroom level. 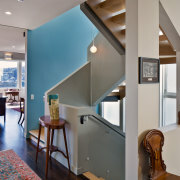 Prior to the renovation, a spiral staircase had accessed a single top floor room which has now been expanded as a complete level, incorporating a study and master suite. Flooded with sun, this renovagted lounge has a dark wall tone. The raised ceiling echoes the roofline. 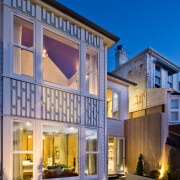 "Heritage rules required that the existing street elevation was retained. 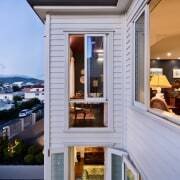 However, new contemporary fretwork complements the classic painted weatherboard and at the same time hints at the modernity of the reworked interior," says Mills. The front door opens into the central living floor that separates the two bedroom levels. 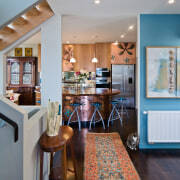 This floor is now completely open-plan and centres around a new floating, open riser staircase which is the first thing you see from the front door. 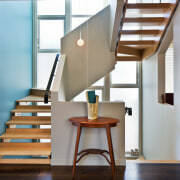 The stair is a work of art in its own right and the vertical circulation path in the design. The roof peak over the stair landing on the top floor includes two large skylights which flood light down the staircase. 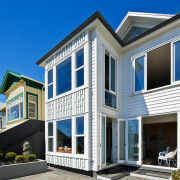 A three-level sandblasted glazed window directly behind the staircase brings in additional natural light. This features etchings created by John Mills. The reconsidered open-plan interior in this renovated villa by architect John Mills maximises light flow and is ideal for family life. On the public living floor, the living room and lounge are at the front of the home, taking in views of the city. 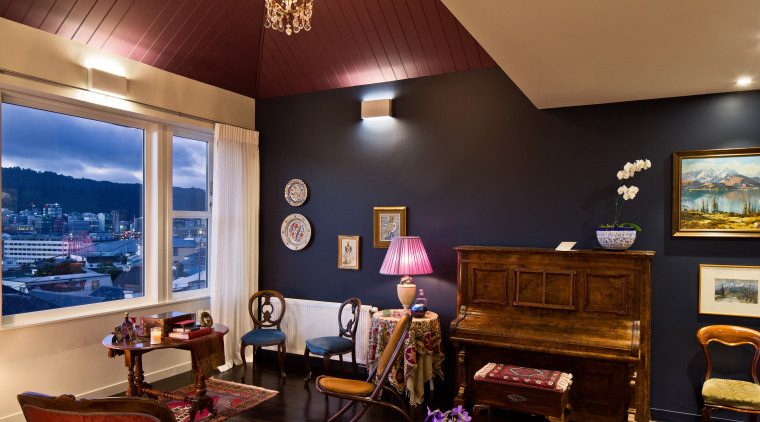 A raised ceiling directly over the living area echoes the roofline above a reminder of the home's character lines. 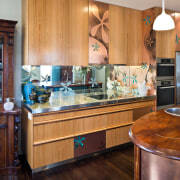 The new kitchen design incorporates an existing island, expanding on its classic Pacifica motif. The kitchen has been moved to the rear with a cosy family space alongside. 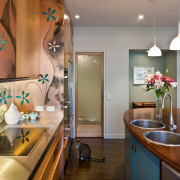 A pocket slider can section off the front rooms from the stairwell and kitchen, providing privacy between. The expanded top floor incorporates the master suite, study and laundry. The rear of this floor provides access to the original backyard space, another request of the owners.